Welcome Back to our Blog and a new article about Scorpios’. 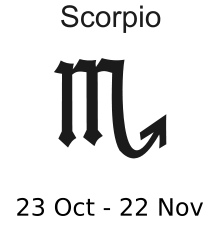 If you are born between 23rd Oct—22nd Nov. you are a Scorpio (both the dates are inclusive). An important point to remember is that if you were born during a cusp, i.e. in the first or last 7 days of a zodiac sign, you will have traits of both the signs, with one of them being more dominant. Being a Scorpio your ruling planet is Mars, your symbol is the Scorpion. (According to some an Eagle/ Phoenix). And your keyword is Secretive. You are a leader, magnetic, determined, ambitious, enigmatic, withdrawn, forceful, dominating, loyal, and discreet. You have strong powers of concentration, are focused, and highly intuitive. You are drawn to spiritualism and the occult. You are stubborn, shrewd, moody, vengeful, possessive, and jealous. You will need to master your temper otherwise you will likely quarrel with everyone and spoil all your relationships. At some stage of your life there will likely be a hint of a scandal. You tend to react strongly to any kind of insult (real or imagined), and will not let it go quietly. You are obsessive to a fault and can hold a grudge for a long time. You have the patience to wait for an opportune moment to take your revenge. And your revenge has all the hall- markings of a scorpion’s ‘sting”. For you there are no half-measures, and rash acts of vengeance will likely boomerang. Scorpio is the most intense and passionate sign of the zodiac, and also the most misunderstood. You appear to be cool, calm, and collected but underneath you are very passionate and have hidden depths. You have tremendous endurance and resilience, and the difficult early years will make you stronger. You are successful in the latter half of your life. By controlling your temperament you will find success much more easily. Scorpio assets are power, purpose, insight, shrewd judgments, single-mindedness and fierce determination. You need to be aware that you have an unconscious desire to be destructive (even self- destructive!). You are very demanding of yourself and of others. You need to learn to be light hearted and to balance yourself. Scorpions are strongly passionate- conservative, conventional, proud, pretentious, and have a very high temper. Tend to be idle and to procrastinate. Scorpio people will ferret out others’ secrets, but are reluctant to share their own secrets. You are affected by moods and feelings, but do not want others to read you. People find it difficult to remain neutral about you. They either love you or hate you. As a parent you will fiercely protect your children. You are assertive, ambitious, demanding, and strict, and will ensure the best for your children; and expect a great deal from them in return. You need to be careful that you do not push them too hard. Do not insist on them following in your footsteps, or completing your dreams. Your strong personality could leave indelible marks, and not let them develop their own personality, and give the children an inferiority complex. You like committed, clearly defined, structured relationships. Someone to share with, who can match you physically and mentally. A person strong in their own right. A partner in the true sense. You are best with people who are dependent on you and who agree with you. You need to be appreciated, and be acknowledged. You are basically a person of action. But being pulled in different directions tends to make you procrastinate and put things off. You need work which will stretch you to the limits—which is challenging and intellectually demanding. A Scorpion is a better consultant and advisor than a politician. You will excel in any career dealing with ‘healing’. Biology. Engineering. Films. Accounts. Banking. Insurance. Drama .Physician. Your weakest organ is your heart. Be careful not to strain it. You are likely to gain weight in middle age. Your Lucky Colours- Reds. Scarlet. Crimson. Rust.